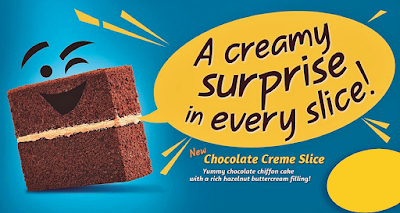 Luckyfinds: A Snack Surprise in every Chocolate Creme Slice! A Snack Surprise in every Chocolate Creme Slice! Every now and then, we found ourselves craving for a quick-yet-filling snack or needed a satisfying treat in the middle of the day to pick up our mood. Most of the time, our choices are limited to “convenience store” food, which by force of habit makes it monotonous. Thankfully, Goldilocks has the best and yummiest solution: the country’s number one bakeshop offers the new Chocolate Crème Slice, which is sure to liven up your taste buds and fill your stomach in a snap! The Chocolate Creme Slice looks amazing, tastes divine, has a variety of textures and of course the shopping list has to include chocolate! This yummy chocolate chiffon cake with a rich hazelnut buttercream filling truly exemplifies premium quality, at an affordable price.